The Fellowship was fortunate enough to obtain a copy of ZOMBIES VS ROBOTS ANNUAL from IDW Publishing. Chris Ryall, Daniel Wilson, Rio Youers and Kevin Grevioux write, and Ashley Wood, Sam Kieth, Andy Kuhn and Drew Ford draw. 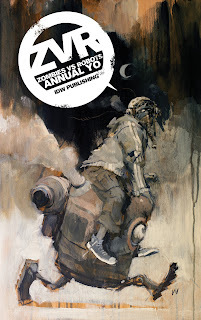 From “the Eisner award-losing pair” of Chris Ryall and Ashley Wood comes another compilation of the popular Zombies vs. Robots series. This annual contains four stories, each centering on a seasonal theme. Spring is a typical battle scene, summer brings a warrior’s self-discovery, fall shows us degeneration, and winter heralds an end. Each of these stories stands alone, but they also fit together in an almost poetic way. Each shows us a separate piece of war and apocalypse—irony, the warrior spirit, senseless death, madness, despair. The writing here is truly impressive, and the combination of styles and themes really works beautifully in my opinion. When I picked this book up, I was admittedly just hoping for a fun zombie war scenario. I’m thrilled to say that I found something much more. There is real depth and beauty here, much more than I expected. I recommend this book as strongly as any I have read. ZOMBIES VS ROBOTS ANNUAL is available now at your FLCS or by order from idwpublishing.com.